The Jabra BT325s provides users with a Bluetooth headset and high performance corded stereo headphones so users never have to miss a call while listening to music. It is designed as the perfect match for portable music devices and Bluetooth phones and provides the convenience of one headset for both listening to music and taking calls. 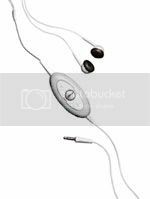 The Jabra BT325s headset comes with high-quality exchangeable stereo ear buds and connects to MP3 players or other devices that support a 3.5 mm corded interface such as a PC or music mobile phone. A clip-on Bluetooth device featuring integrated microphone and phone volume controls enables the headset to connect to Bluetooth enabled devices to support phone calls. The Jabra BT325s comes in an urban and rain shower proof design and features 8 hours of music/talk time and 240 hours standby time.